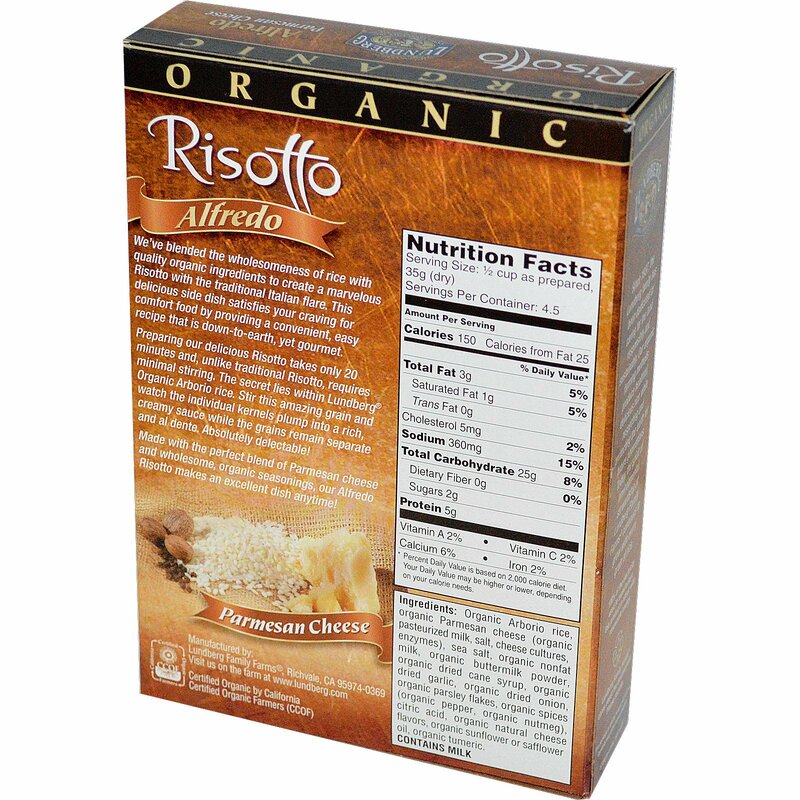 We’ve blended the wholesomeness of rice with quality organic ingredients to create a marvelous Risotto with the traditional Italian flare. This delicious side dish satisfies your craving for comfort food by providing a convenient, easy recipe that is down-to-earth, yet gourmet. Preparing our delicious Risotto takes only 20 minutes and, unlike traditional Risotto, requires minimal stirring. 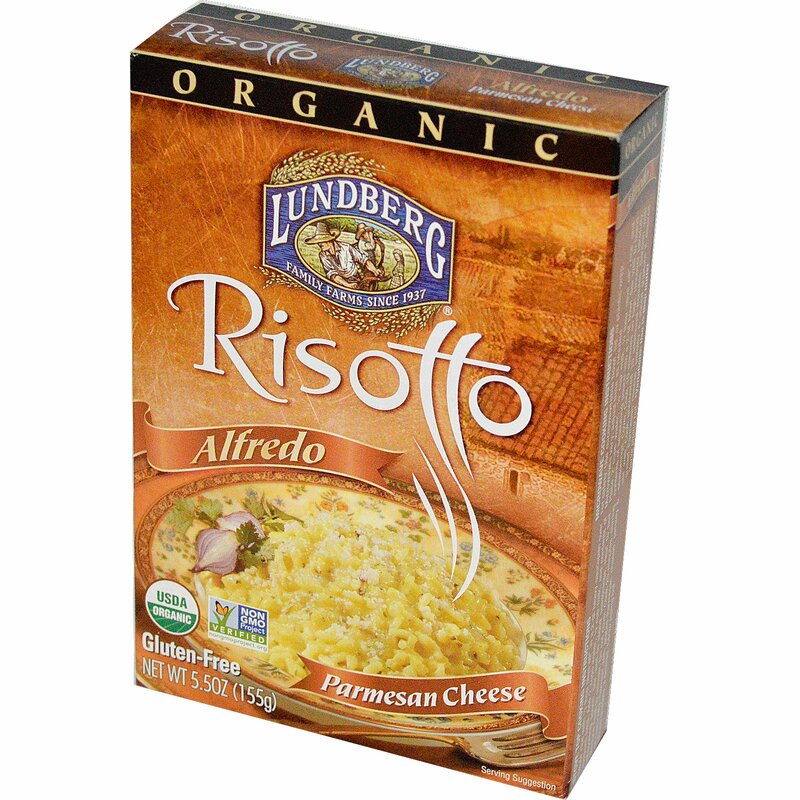 The secret lies within Lundberg Organic Arborio rice. Stir this amazing grain and watch the individual kernels plump into a rich, creamy sauce while the grains remain separate and al dente. Absolutely delectable! Made with the perfect blend of Parmesan cheese and wholesome, organic seasonings, our Alfredo Risotto makes an excellent dish anytime! Since 1937, the Lundberg family has been dedicated to caring for the land responsibly and sustainably. Our organic farming methods produce healthful, delicious rice while respecting and protecting the earth for generations. Today, the spirit of environmental stewardship at Lundberg Family Farms continues to grow with every grain of rice. Saute' rice with 1/2 tbsp olive oil* in a 2-qt heavy saucepan over medium heat. Add 2 cups water, 1/2 cup milk, contents of seasoning pouch, stirring well to blend seasonings. Heat to boil. Reduce heat to simmer. Do not cover. Cook 20 minutes, stirring occasionally. Garnish with grated Parmesan cheese, parsley & sliced shallots if desired. Serve piping hot. For Safety: Use microwaveable bowl, lid, or plastic wrap. Microwaves vary; adjust time as needed. Place 2 cups water, 1/2 cup milk, 1/2 tbsp olive oil*, rice, and contents of seasoning pouch into a 2-qt bowl. Stir well to blend seasonings. Cover. Cook 10 minutes on high. Uncover carefully, stir well. Cook uncovered for 10 additional minutes. Garnish with grated Parmesan cheese, parsley & sliced shallots if desired. Serve piping hot. *Variations: Use 1/2 tbsp butter. Organic Arborio rice, organic parmesan cheese (organic pasteurized milk, salt, cheese cultures, enzymes), sea salt, organic nonfat milk, organic buttermilk powder, organic dried cane syrup, organic dried garlic, organic dried onion, organic parsley flakes, organic spices (organic pepper, organic nutmeg), citric acid, organic natural cheese flavors, organic sunflower or safflower oil, organic turmeric.